South County school districts are moving closer to becoming a hub for collaborative Career and Technical Education opportunities intended to connect students with high-wage, high-demand jobs after graduation. Partners and supporters of the South County CTE Collaborative gathered recently to celebrate progress the initative has made. Milestones have included the recent donation of 10.99 acres of land by the Douglas County Commissioners for a state-of-the-art Career and Technical Education center in South County. Additionally, the first-ever local collaborative CTE program for high school students within five South County school districts has been developed and will launch next fall. “We couldn’t be more excited about where we are now. 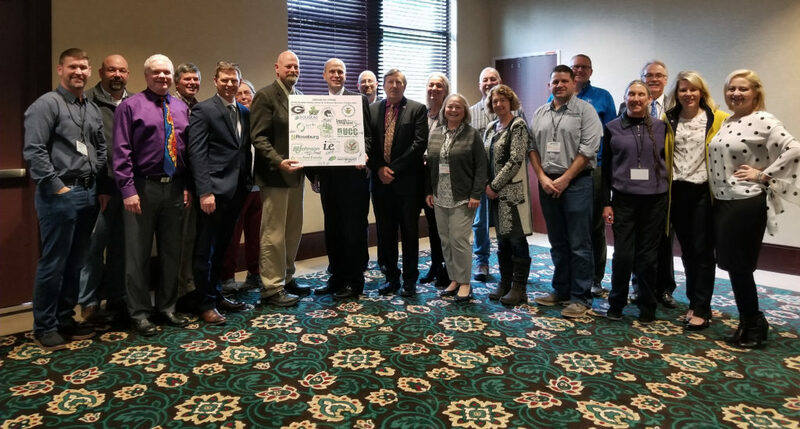 We have come a very, very long way,” said Michael Lasher, Douglas Education Service District superintendent, at the gathering last month at Seven Feathers Casino Resort in Canyonville. South County CTE Collaborative supporters and partners gathered recently to celebrate the iniative’s progress. Supporters at the event signed a Declaration of Cooperation to show their commitment to seeing the project through to completion. Gwen Soderberg-Chase, director of Douglas County Partners for Student Success and the Umpqua Valley STEAM Hub, said the South County CTE Collaborative is just the kind of community-wide initiative Douglas County needs. The partnership aligns with the goals of Bright Futures Umpqua, the DCPSS initiative intended to provide career-connected learning opportunities for students that connects to plans for their future.